PS Renewables was at this week’s Solar Energy UK conference in Birmingham where it was good to network with other solar businesses who clearly feel the worst is behind us and share our aspirations to grow and build a strong solar future. Congratulations to everyone who was honoured in Wednesday evening’s Solar Power Portal and Clean Energy awards. 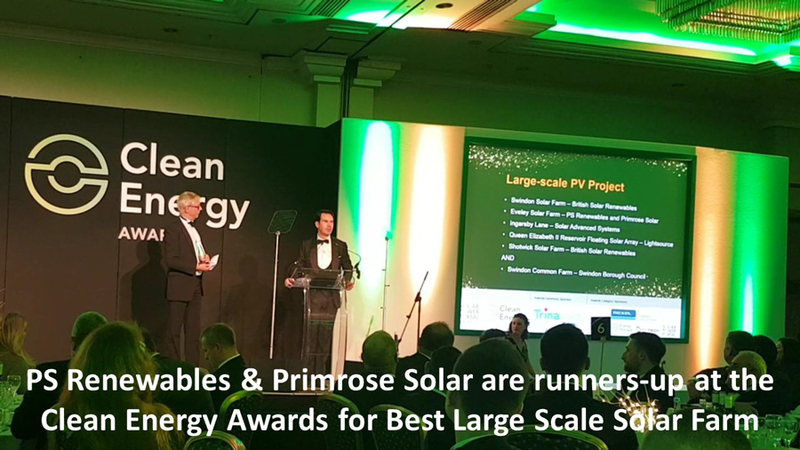 Our 49 MW Eveley Solar Farm in Hampshire was just pipped to the post for the award for Best Large-Scale PV Project by Lightsource for their extraordinary Queen Elizabeth II floating solar farm, so well done to them. According to Solar Media, the shortlisted projects represent the best and brightest developments from the renewable energy sector over the last year so we were delighted that Eveley was recognised for its achievements – being built on time, on budget, and with the support of the local community. And all of this achieved during the “solarcoaster” which has characterised the industry in the past year. Thanks also to Primrose Solar, who acquired the full project rights to Eveley last year and worked in partnership with us to complete the build in March 2016.